Somehow familiar, somehow entirely extraterrestrial. 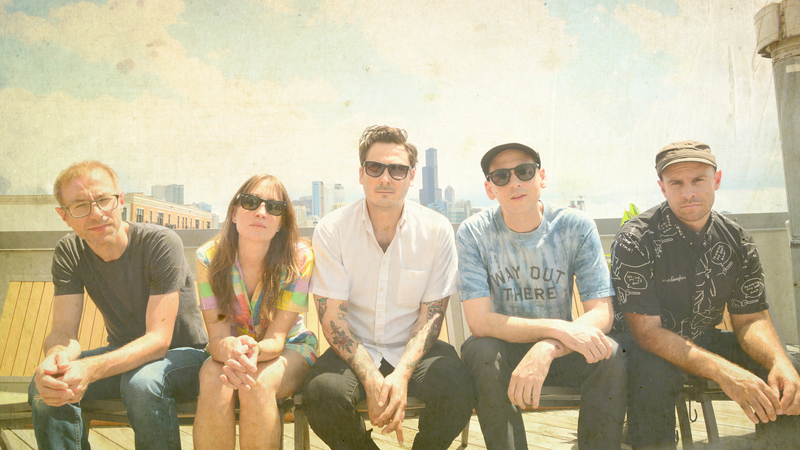 Chicago’s Joan of Arc have been making "music for no audience" for over two decades. Their mission, as described by bandleader and enigmatic front man of numerous influential projects, Tim Kinsella, is to distance themselves from the music scenes they are both fans of (and staples within) in the name of creating something defined by outlier status. “We set out knowing that our failure to be embraced by any prefab audience would be the proof of the singularity of our expression.” The question upon walking into a crowded Brooklyn club filled with a diverse array of fans awaiting the band’s first New York performance in years is: have they succeeded? The band has released over 20 albums in their over 20-year history. The current lineup features forever member Tim Kinsella on guitar and vocals, long-time members Bobby Burg and Theo Katsaounis on bass and drums respectively, as well as Jeremy Boyle and artist Melina Ausikaitis—who played a guitar-shaped instrument that emitted delayed clicks and other strange sounds and whose acappella tune was one of the most arresting moments of the night. Their music is difficult to encapsulate, as it jostles between alternative and experimental, veering close to dance music on its way to entrancing drones. Nothing is off limits. JOA make deceptively complex music, somehow familiar, somehow entirely extraterrestrial. Their signature lack of concern for reception in the name of something that feels right, even and especially when it breaks rules, is admirable and far too rare a thing. Because of their agility, yet instantly recognizable characteristics, the group are much beloved by a devoted crowd who they are still able to befuddle. Songs were woven together, disrupted by long empty pauses that left some giggling and others half-entranced and swaying to the lost notes. Staples of their repertoire were reimagined as with the ghostly “Shown And Told”, from their 2008 record Boo Human, which was transmuted from an acoustic number into a stuttering full band exploration. The lyric “there are corners of your own home you’ve never noticed before” took on new meaning as the subtle tune was approached from this new perspective. Joan of Arc treated the crowd to a few songs from their upcoming record, He’s Got The Whole This Land Is Your Land In His Hands, due out early next year (pre-order here), including the first single, “This Must Be The Placenta.” A mishap with the band’s gear left the song without its melodic backtrack and was stripped down to simple bass, drums, and vocals. Despite the technical glitches, the song was conveyed in its simplest form, and proved to be an even stronger number than one might have thought at first glance, giving all present further reason to anticipate the release. Early in the set Tim Kinsella says he has nothing to say, and later goes on a long tale about seeing The Misfits in a hockey arena. Kinsella’s unfiltered honesty and poetic self-reflection has often found his work paired with words like “emo,” itself a problematic term, but his scope of expression reaches far beyond sad, curmudgeonly grumbles. His words here are surreal, poignantly anxious, movingly intimate and conversational. Tunes like “Stemingway and Heinbeck”, featuring the lyric “I’m sorry about my body, it’s all I’ve got and it’s getting the best of me,” were repeated like a mantra, and became impossible to view coldly or from any kind of distance. At these recurrent moments it was as if all present were for a moment on equal footing. That is a rare thing in today’s live music landscape, where performers so often stand on a stage above a crowd, feeding off hero worship and shaped by their reputations and the pop-culture characters they play. Joan of Arc have succeeded in rejecting any rigid music scene structures, and are beholden to no proven model. That is perhaps what makes the experience of seeing them exciting and fresh, 20-plus years and counting.